Patrick Dunleavy and Chris Gilson discuss social scientists’ obligation to spread their research to the wider world and how blogging can help academics break out of restrictive publishing loops. This article was first posted on the LSE’s Impact of Social Sciences blog on 24 February. 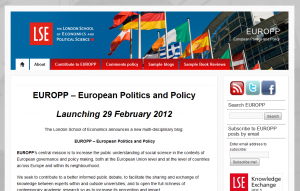 LSE’s Public Policy Group already run two academic blogs and you are preparing to launch two more in the coming months. Yet many academics are still sceptical about the value of blogging. What is it that gives you so much confidence in academic blogging as a means of dissemination and engagement? One of the recurring themes (from many different contributors) on the Impact of Social Science blog is that a new paradigm of research communications has grown up – one that de-emphasizes the traditional journals route, and re-prioritizes faster, real-time academic communication in which blogs play a critical intermediate role. They link to research reports and articles on the one hand, and they are linked to from Twitter, Facebook and Google+ news-streams and communities. So in research terms blogging is quite simply, one of the most important things that an academic should be doing right now. Academic blogging gets your work and research out to a potentially massive audience at very, very low cost and relative amount of effort. With platforms like WordPress (which we use here), you can set up a blog and have your first article online in no more than 10 minutes. Recent research from the World Bank has shown that blogging about an academic article can lead to hundreds of new readers when before there were only a handful. Blogging in multi-author blogs is a great way to build knowledge of your work, to grow readership of useful articles and research reports, to build up citations, and to foster debate across academia, government, civil society and the public in general. You can see that your longest established blog, British Politics and Policy, is being read across the media, the civil service, Parliament and government in the UK. Did you foresee this impact when you started it as an election blog in 2010. Why do you think that blog in particular, has been so successful at penetrating these professions? 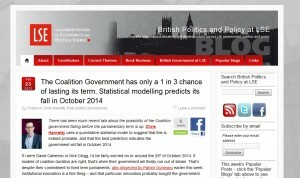 When our BPP blog began life as the ‘LSE Election Blog’ in 2010, we were testing the waters a bit. From the outset, it quickly became clear that there was huge enthusiasm from readers, from LSE academics across many departments, and from other universities and other sectors entirely (like the media and pollsters) for this kind of initiative. That immediate response gave us the confidence to convert the blog into British Politics and Policy and make it a permanent effort at knowledge exchange. Even then we never really predicted that by now we would have over 7,000 readers every week and nearly 9,000 Twitter followers! We believe that BPP has been successful because we try relentlessly to promote public understanding of social science and to go deeper into issues than conventional media allow. On British TV and radio academics (at least up until now) have tended to be the ‘talking heads’ in interviews and news articles, offering short comments, with little detail and no links to their wider work. British newspapers are also run chiefly by people with English literature or history backgrounds, who seem to view data and charts and evidence as anathema. Yet we appeal to the huge and growing population of well-educated graduates who know a lot about politics and policy areas and want to know more. A few years ago, these folk were flocking to the BBC supersite, but now government cuts and newspapers criticisms have forced the BBC to cut back its text offerings to a shadow of its former self. So we built the BPP blog as a space for more in-depth but still highly topical comment from academics at LSE and across the UK, and from the many skilled practitioners in NGOs, charities, the media, political life and think tanks who work tirelessly to sustain better quality political debate. We hope it’s proved its value already as a place where people can come to find new ideas and evidence-based arguments around the issues of our times. It’s also proved useful for media folk to use our blog as a source of information about a story, or to find the right academic expert to comment. You use a multi-author format across each of the blogs. Can you tell me, and those new to academic blogging in particular, why you favour this over a single-author blog format? Your new venture covers European Politics and Policy, under the ‘brand name’ EUROPP. How has this concept evolved from BPP and what readers do you hope to attract? Again our mission remains to increase public understanding of the social sciences, but with EUROPP in the context of European governance and policy change. And we interpret ‘European’ very broadly here to cover not just the European Union but also the 30+ countries of Europe, and those in its neighbourhood regions. Of course, pan-European issues, like the financial crisis, and the EU’s foreign relations, are very interesting and ‘hot’ right now. So we are launching at this time to help cover the March EU leaders’ summit and developments around it. But beyond that there are lots of fascinating and important developments certain to happen across the countries of Europe over the rest of this year, beginning with the French elections, and we will be trying to cover as many of these as we can in an evidence-based way. It’s going to be a huge learning curve for all of us involved in the blog, but we have Sara Hageman from LSE’s European Institute as Academic editor of the blog and great buy-in from a big community of academics at LSE and across Europe. We want to attract the widest possible range of readers who are interested in Europe; politicians and civil servants from across the continent and beyond, academics, journalists, students and citizens who are interested in European affairs. And as with the BPP blog, our range of disciplines and topics will be really broad, covering economics, media, culture, politics, social changes, and history and theory useful for the analysis of contemporary changes. We’ll also be reviewing a great range of new academic and serious books on European issues, every week. Finally, what are your three short but sure-fire tips for academic bloggers working to improve their craft? Make sure your titles tell a story, and your findings are communicated early on. Academics normally like to build up their arguments slowly, and then only tell you their findings with a final flourish at the end. Don’t do this ‘Dance of the Seven Veils’ in which layers of irrelevance are progressively stripped aside for the final kernel of value-added knowledge to be revealed. Instead, make sure that all the information readers need to understand what you’re saying is up front – you’ll make a much stronger impression that way. Remember the Web is a network, not a single-track railway line – and not everyone uses the web in the same way. So once you have a blog post, do everything you can to get the key content out to diverse readerships who want to see it. Post your links to Twitter (several times, at different times of the day) and Facebook. Let people subscribe by RSS or email. Talk to your readers. Encourage people to comment (but only post their comments after moderation) and respond to comments and to Tweets. Talk to people on Twitter and Facebook when they discuss your work. And be reciprocal, open-minded and fair in sharing your content with others and linking to their work – improving the public understanding of social science is a huge collective good for all social scientists. We can all flourish together in the new paradigm for academic work. The LSE Public Policy Group also runs the British Politics and Policy blog and is preparing to launch the LSE Review of Books blog later this Spring.